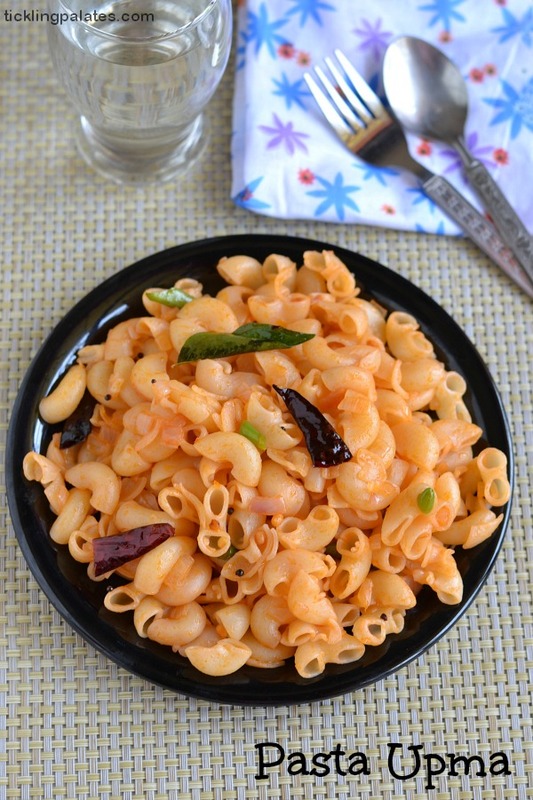 Pasta Upma recipe. 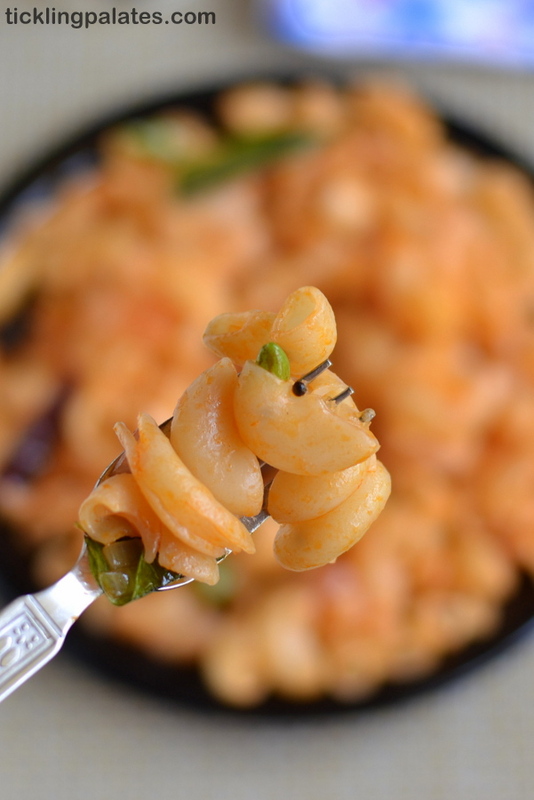 A fusion recipe fusing my love for south indian upma and the Italian pasta. 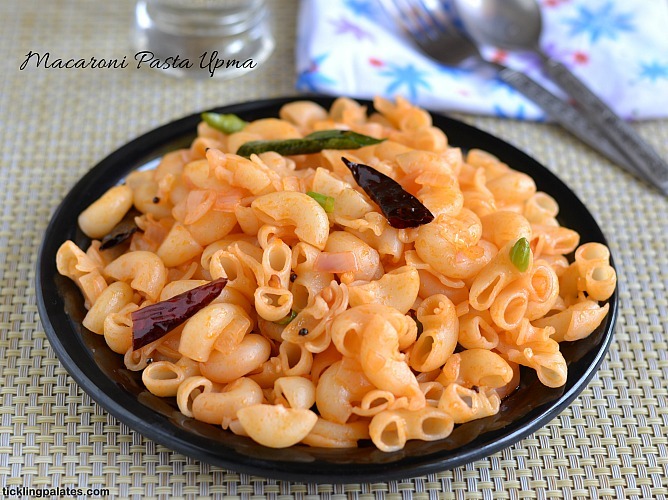 This Macaroni Pasta upma is quick to cook and makes a filling breakfast or an evening tiffin when the kids come home hungry from school. Pasta is the new found love of my kids and I’m slowly trying out new recipes using pasta that are not only easy but also quite filling at the same time. Basically I’m the upma lover at home and the others do not like it very much. Though they do not complain when I make upma, you can see the lack of enthusiasm while they are eating. This pasta upma is my fusion-ised take on the regular upma. Now it has become the most favorite breakfast recipes of my kids and I also pack this for their snack box for break on their request. Though the tomato sauce is usually not added to the upma, somehow pasta and tomato are inseparable in my books, so I added tomato sauce to make it a bit tangier as the pasta alone will taste quite bland if eaten after sometime. You can always skip the tomato sauce and instead add 1 tsp lemon juice after switching off the stove, toss well before serving. If making for the kids, adjust the chilies according to their spice level. Basically any variety of pasta can be used and I have used macaroni here. You will also like this kid friendly recipes Bread upma, Avocado chocolate grilled sandwich, Eggless oats and dates pancakes, Pasta in roasted red bell pepper sauce and Eggless Butter Scones which I’m sure they will enjoy. Pasta upma for a filling breakfast. 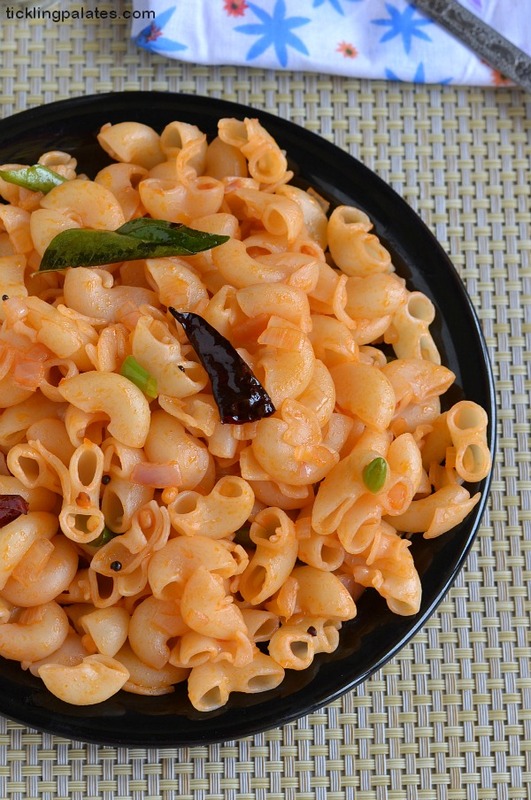 A fusion take on the regular upma using macaroni pasta. Heat a large, wide saucepan with 6 cups water. Add 2 pinch salt, 3 drops oil and bring it to a boil. Add the macaroni pasta and cook till Al dente or or till soft according to your preference. Drain the cooked pasta into a colander and pour cold water on it to stop the pasta from cooking further. Keep aside for the excess water to drain completely. Chop the onion, ginger and green chili finely and keep aside. Heat a pan with oil. Add mustard seeds and let it splutter. Add urad dal, broken dry red chilies and roast till golden brown for a few seconds. Add chopped onion, ginger, green chili and curry leaves and cook for 2-3 mins over low flame till the onions become translucent. Add tomato sauce, salt and cook for 1 more minute. Add cooked pasta and cook for 1-2 minutes by tossing well so that the pasta gets coated well. pasta upma looks super! and nice clicks. I love this shape pasta, but i’m not able to get here.. that plate makes me hungry infact very very hungry..
Nice fusion of Indian upma and pasta, looks delectable..